Go out into the city of Puebla, on Oct. 31 after the sun goes down and you’ll see costumes, candy and face paint, but this isn’t Halloween. The Day of the Dead, or El Dia de los Muertos our guide explains, is more like a celebration for the dead. We are in Puebla, Mexico, the place where the Volkswagen Beetle is made, to celebrate its impending death. Admittedly, this is a strange thing to do for a car, but for many people the Beetle was part of the family. In the 1930s, Adolf Hitler hired Ferdinand Porsche to make a cheap, simple car for the people, something that would get the country moving on the new Autobahns. Porsche often gets credit for the design, but the Beetle owes as much, if not more, to other engineers: a Hungarian named Bela Barenyi; Hans Ledwinka, chief designer for Czech automaker Tatra; and a Jewish engineer named Joseph Ganz who was chased out of Germany by the Gestapo. They each played large roles in the creation of the car we know today as the Beetle. 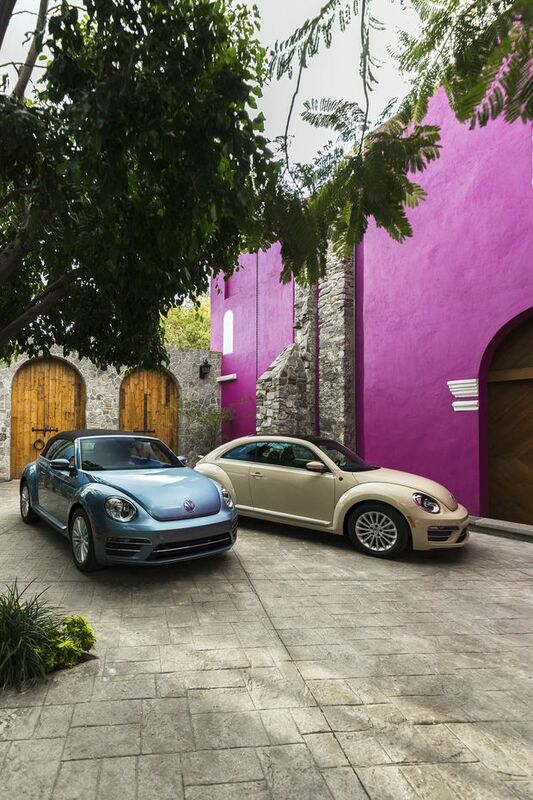 Two Beetles photographed in Puebla, Mexico, where the car has been produced for decades. By the end of the war in 1945, the Nazi regime had only managed to produce 630 of the “KdF Wagens,” according to Volkswagen’s own historians. It was under the British military government – which took over what would become Volkswagen’s Wolfsburg, Germany factory – that the first Beetles were produced. The first Volkswagen Type 1, as those early cars were known, rolled off the line just after Christmas in 1945. It was initially a tough sell in the United States. The company sold only two Beetles in the U.S. in 1949 said Jeffrey Lear, the current product manager for the Beetle. After a decade or so, the Beetle did fulfill its original purpose, becoming cheap transport for the masses and – as unlikely as it seems given its origins – a symbol of the 1960s counter-culture. At a time when American cars all looked like enormous square slabs of steel, here was this slow little rotund Bug. The famous “Think Small” advertisement struck a chord. Marsha Hollinshead, a current Beetle owner, remembers her grandparents had one in the sixties, which they imported from Germany. It was so different from everything else on the road at the time, she said. “I just remember it being kind of cold,” she added. With the engine in the back, the heater was famously ineffective. Lear remembers his mother telling the story of how, when she was a girl, her parents moved the entire family across the country in a Beetle: 2 parents, 2 children and all their prized possessions in this little car. 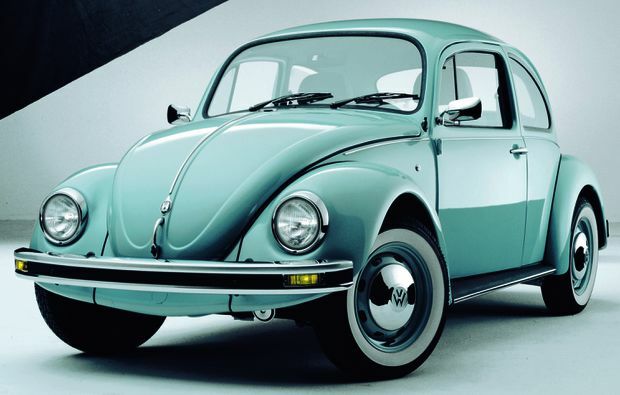 In Canada, nearly half a million of those original Beetles were sold from 1952 to 1979. In Mexico, however, production continued until 2003. Beetle purists would say the New Beetle, which went on sale in 1998 with a flower-vase on the dashboard, was no Beetle at all. It had the engine in the front, instead of the back. It was water-cooled, not air-cooled. And, most damning of all, it was no longer meant to be cheap transport for the masses. Beetle cabriolets from 1949, 1958 and 1979, the vehicle's final full production year. The cause of death is complicated. When Volkswagen announced in September it was killing off the Bug, the response was like an outpouring of grief. It was news. People who didn’t normally care about cars suddenly cared that production of this one was ending. Suddenly everyone had a Beetle story, which shouldn’t come as a surprise given that more than 21 million of them have been produced. Javier Lara's 1984 Beetle, dressed up to celebrate the Day of the Dead. In Canada, nearly half a million original Beetles were sold from 1952 to 1979. The scale of the Volkswagen factory in Puebla is almost impossible to imagine. It’s like a small city: there’s a convenience store on the corner and a fire department. Up to 2,300 vehicles are stamped, welded, painted, assembled and finished here each day by 14,000 workers, according to the company. If the USMCA negotiations had gone differently, ending Beetle production would’ve likely not been the only change coming to this factory, but production is humming along now. A metal press the size of a gymnasium stamps out steel fenders. Inside another enormous building, door-less cars – not just Beetles, but Tiguan SUVs and Jetta sedans – pass overhead. There’s always noise: grinding, thumping, squeaking. A robotic welding arm zaps metal as sparks fly. At the finish line, four lanes of completed cars inch forward on conveyor belts. It’s a well-rehearsed ballet of labour and logistics. 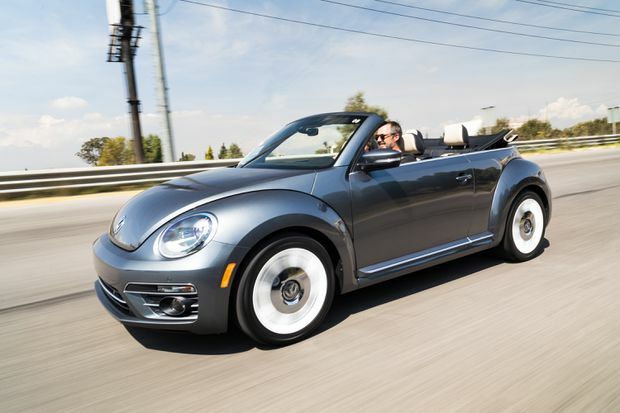 The 2019 Beetle Wolfsburg Edition convertible starts at $28,475. Driving the 2019 Beetle Wolfsburg Edition – a run-out special edition with quilted leather seats and two-tone wheels – on the roads around Puebla cures any sense of loss. The 2.0-litre turbocharged engine and six-speed automatic transmission feels gutless at highway speeds. Even with the gearbox in “Sport” mode the throttle pedal only has a vague relationship to the speed of the car. At least the chassis feels good, riding reasonably comfortably over the potholed roads. The original Beetle was famously slow, but since it’s no longer the cheapest thing on wheels, expectations are higher. The starting price of the Wolfsburg Edition is $24,475 for the coupe and $28,475 for the convertible. You can buy a Chevy Spark for $10,095 or a mid-range Nissan Versa hatchback for $18,000. Even VW’s own Jetta sedan is slightly cheaper. The New Beetle’s job was not to provide cheap transportation, but to tap into baby boomer nostalgia similar to the reborn Ford Thunderbird, new Mini, or Chrysler PT Cruiser. There’s no doubt the Wolfsburg Editions will be snapped up by fans and collectors, nostalgia for the bug isn’t what it used to be. Each Beetle generation has done worse than its predecessor. On average, VW sold 18,000 original Bugs per year in Canada. The New Beetle averaged 3,500 sales per year, while the current Beetle averages around 2,000. “The Beetle had a pretty good run over three generations,” Lear says. Production capacity at the Puebla factory will likely go towards making more Tiguan SUVs, a spokesperson for VW Canada said. 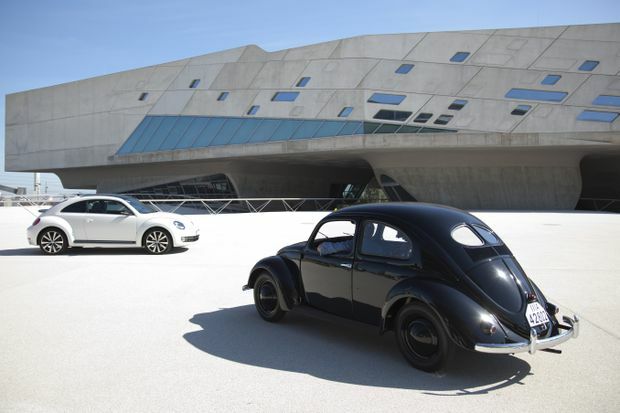 “There are no immediate plans to replace [the Beetle],” Hinrich J. Woebcken, president and chief executive of Volkswagen Group of America, said in a statement. The company will instead focus on family-friendly vehicles (read: SUVs) and electrification, he said. If there is any hope for the Beetle’s future, it is electric. Volkswagen is relaunching the Hippie Van in 2022 as an all-electric model. The I.D. Concept car shown at the Paris auto show in 2016 certainly looks Beetle-esque. The fact is, the Beetle survived Hitler and the war, but it can’t survive the onslaught of SUVs and waning nostalgia. 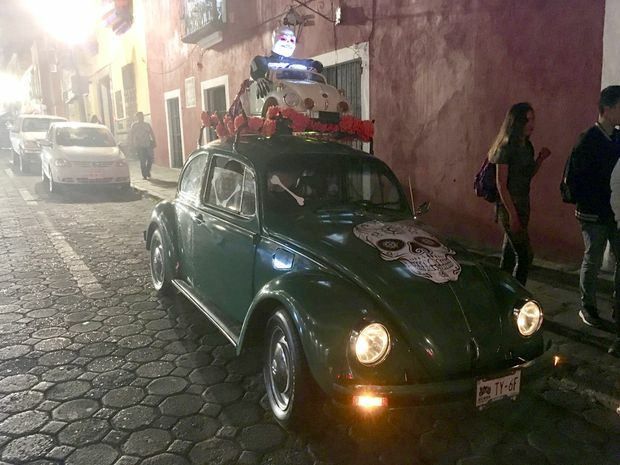 Expect the celebration of the Beetle to go on long after the Day of the Dead is over, continuing at least until the very last one rolls off the line in Puebla in mid-2019.